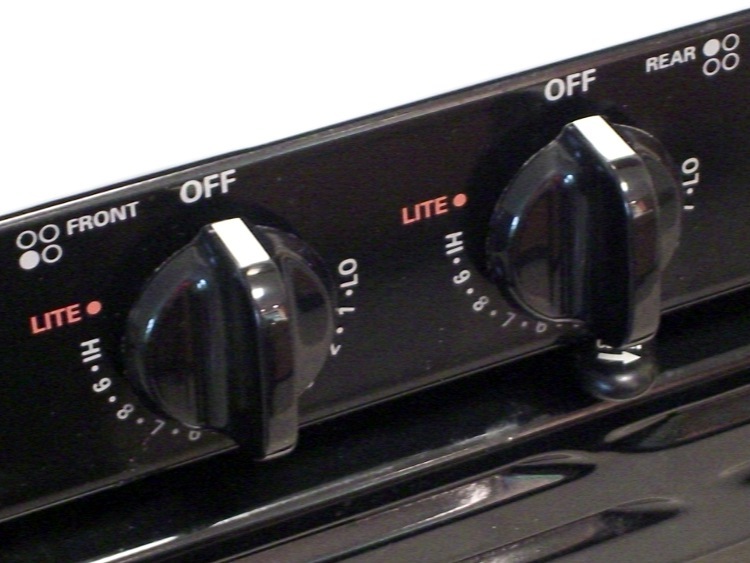 The black knobs on our black-front Kenmore stove have slightly raised pointer extensions. At a glance, you cannot tell whether the knob points upward to OFF or downward to 5. Oddly, the oven temperature knob has a nice white index line engraved (well, molded) in the pointer extension. So it’s not like they didn’t know how to do index lines. I’m guessing they had to take a buck out of the build cost and omitting four index lines added up to just the right amount. I added tape markers shortly after we got the thing. The previous tape was fluorescent orange; the adhesive lasts several years before turning gummy. These new markers are snippets of outdoor-rated retroreflective tape and should last longer. Run the knobs through the dishwasher occasionally to get ’em nice & shiny. Surprisingly, that doesn’t seem to bother the tape.